Shearing the Flock: When are you Shearing? • Shearing sheep before lambing equates to healthier and more productive lambs. Recent research indicates that shearing may improve blood flow to the unborn lamb. 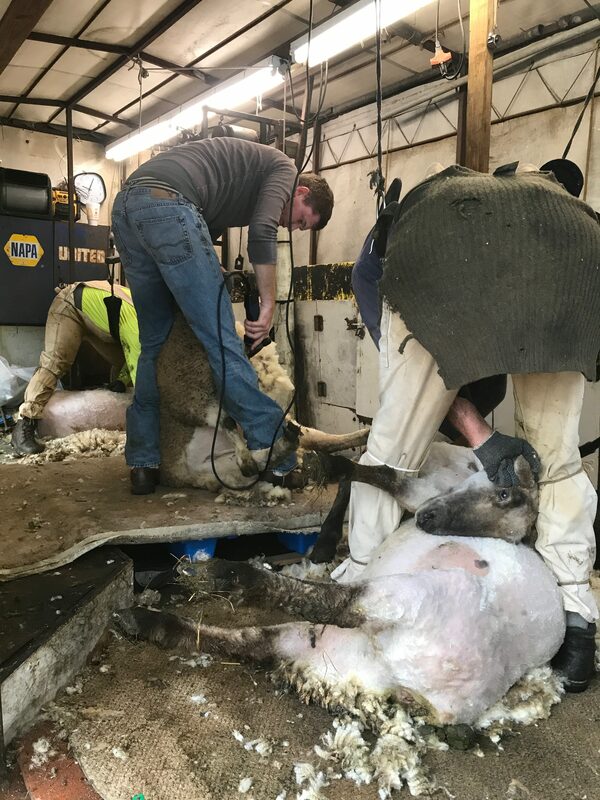 • Shearing will stimulate ewes to seek shelter prior to lambing and reduce the chance of lambs being born outside, where they are more likely to become hypothermic. • Shearing ewes prior to lambing will increase ewe feed intake and increase the calories ewes consume, which helps meet growing nutrient demands during this phase of production. • Shearing ewes will help keep the barn warmer and drier. 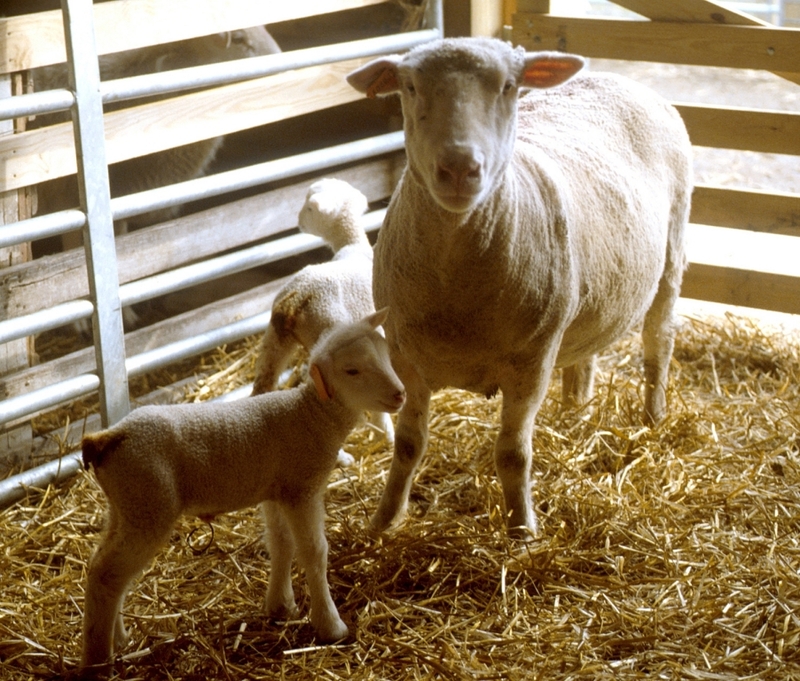 • Shearing ewes prior to lambing creates a cleaner environment for the newborn lambs and helps the lambs nurse sooner. 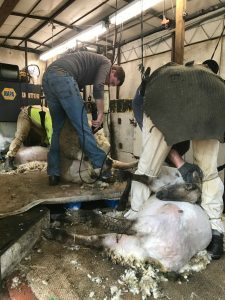 Shearing before lambing time also is a good practice to improve the value of the wool clip, Redden says. Normally, the stress of lambing causes a small break in the wool fiber. If this break is at the end of the fiber because the ewe was shorn close to lambing, it doesn’t reduce the value of the wool. However, if ewes were sheared midway through the lambing season, the fiber can break in half, which reduces the fiber’s usefulness. “Maintaining good management practices when we harvest our wool is important,” Redden says. • Keep ewes off feed and water for at least 12 hours prior to shearing. • Don’t shear wet sheep. • Bed the barn with fresh straw one week prior to shearing. 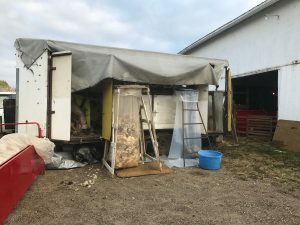 • Reduce the animals’ contact with poly twine and poly tarps that eventually could be mixed in with the wool. • Sort off wool that is heavily contaminated with manure, vegetable matter or paint. • Maintain a clean shearing floor. • Sort and package fleeces into similar wools (main line, bellies and tags). • Shear sheep by wool class (fine vs. medium wool breeds), keep the classes of wool separate and sweep the shearing floor between groups. “Proper packaging of wool improves your wool harvest and improves the reputation of American wool,” Redden says. Posted by Braden Campbell at 8:00am November 13, 2017 Posted in Management and tagged Economics, Health, Management, Reproduction, Wool. Bookmark the permalink.